Savvy business owners and executives are always on the lookout for new marketing ideas. An effective marketing plan is one that involves multiple approaches, such as online ads, social media marketing, and of course, physical advertisements like billboards and signs. One oft-overlooked option is the wealth of advertising space available in elevators. Commercial elevators around the Salt Lake City area are prime real estate for ads that build brand awareness. Can elevator advertising really work for my business? Advertising in well-maintained, high-quality elevators can be an effective strategy for virtually any business. The occupants of elevators aren’t going anywhere for the duration of the ride. Essentially, you have a captive audience—and that audience is usually bored, and looking for something to do while they wait to reach their destination. Their eyes will naturally be drawn to any sort of advertisement, especially if it’s placed on the inside of the doors, as that’s the direction people usually face while they’re riding in an elevator. What sort of ads would be most effective? Any marketer would tell you that all of your ads should be geared toward your target audience, or a typical buyer profile. For example, if your usual customers are college students, then you’d probably stress the affordability and convenience of your products or services. For ads specifically intended to be placed in elevators, however, there’s another factor you should consider: entertainment value. Once the occupants leave the elevator and go about their business, they might forget about the ads they saw. You need to make your ads memorable, such as by making them entertaining or humorous. Can I advertise in elevators of other businesses? 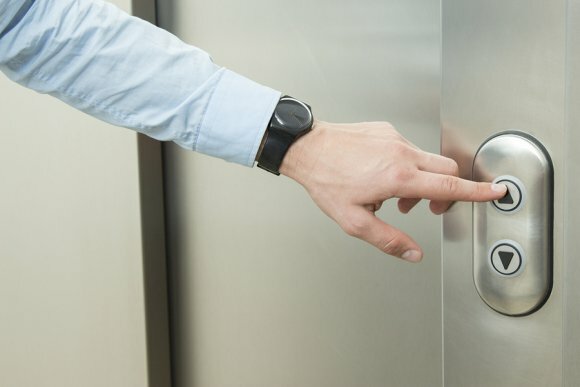 Elevators in your own office building are a great opportunity for free advertising, but you can also check around the area for elevator ad space to rent. Consider advertising in commercial buildings of non-competitor businesses. Ideally, you should target buildings with companies that complement your own. For instance, if you own a flower shop, you could advertise in the elevators of a funeral home or bridal shop.